Choosing the perfect colour scheme for your wedding day is one of the first hurdles of wedding planning to overcome. It needs to fit in with the season, reflect your personalities as a couple and look gorgeous! 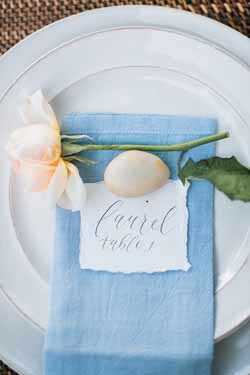 Today we’re looking at a super sweet colour scheme that is made for a Spring or Summer celebration: a soft peach and blue colour scheme. This unusual yet heavenly colour combination is not frequently seen in the world of weddings, but it’s such a pretty colour scheme that we couldn’t resist sharing it with you! 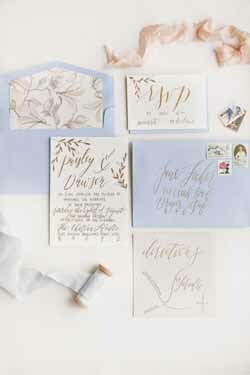 Give your guests a subtle hint towards your delightful colour scheme with your wedding stationery. 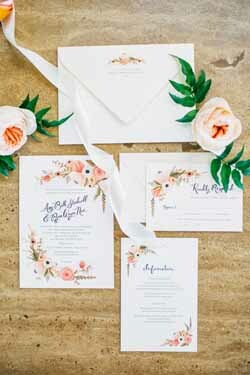 You could opt for invitations in either blue or peach, or find a lovely floral design that includes both. 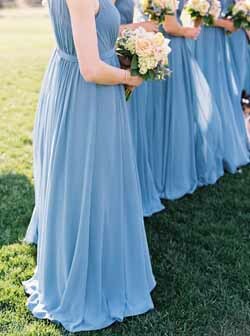 One of the easiest ways to reflect our peach and blue colour scheme is through your bridesmaids’ dresses. 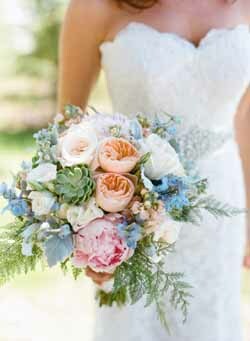 Long, billowing gowns in powder blue shades will look beautiful paired with a peach-inspired bouquet. 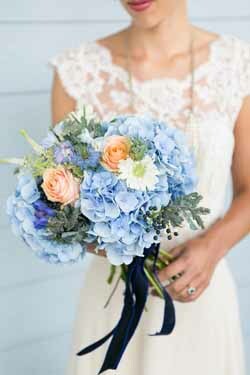 Blue is a seriously popular colour for bridesmaids so you’re guaranteed to find something that your girls will love. 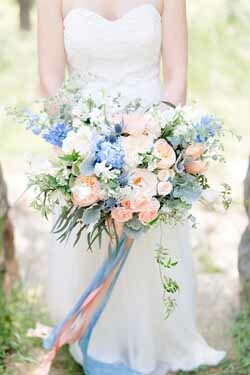 Alternatively, you could choose champagne coloured gowns and a bouquet that focuses mainly on blue blooms. 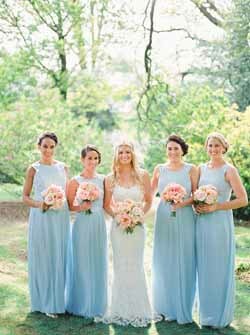 Mismatched bridesmaid’s dresses are always a popular choice, so why not dress half in blue and the other half in peach? Keep it looking coordinated with dresses that are similar styles or fabrics. 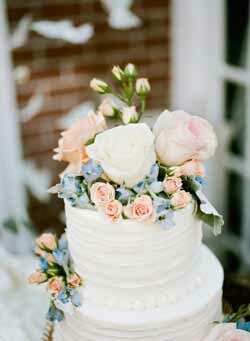 It’s incredibly easy to incorporate a peach and blue colour scheme into your aisle style. 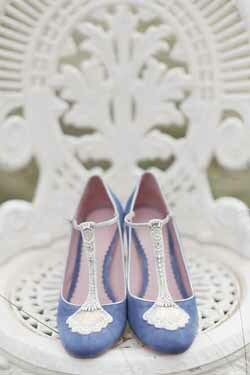 Have you thought about wearing powder blue or soft peach coloured shoes? You could even don bridal separates and wear a blue skirt? Brides are loving two pieces, and it seems that this trend is here to stay. 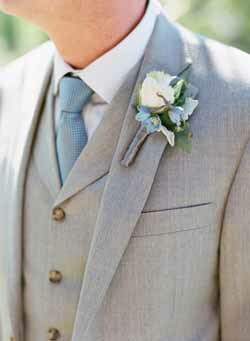 Your hubby-to-be will look divine in a cool blue, grey or cream suit with a peach coloured tie and buttonhole. A range of suit colours fit in with this theme, so he will be spoilt for choice! 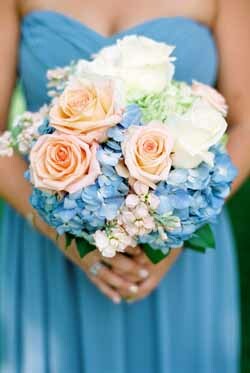 You have tons of choice when it comes to your wedding flowers – peonies, roses and hydrangeas in varied shades of blue and peach will make for a beautiful bouquet. 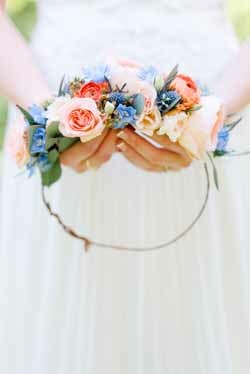 Tie a pastel blue or peach ribbon around the stem of your bouquet for a wonderfully elegant touch. 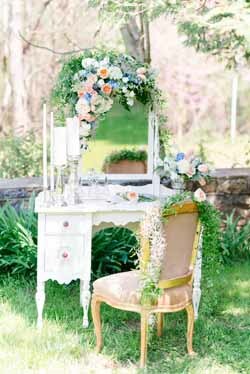 When it comes to your wedding décor you can go down a number of different routes. 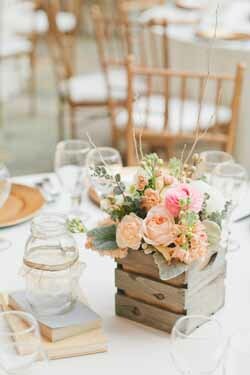 You could create a rustic feel to your colour scheme by adding hessian and wooden touches throughout your décor. 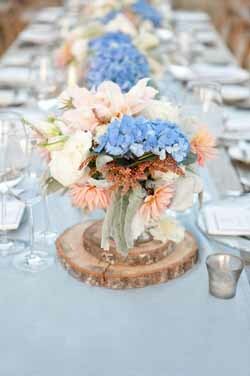 For instance, hessian table runners and wooden tree slices as table centrepieces will look incredible against the contrast of blue and peach. On the other hand, you could keep it simple by adding white accents throughout your reception. 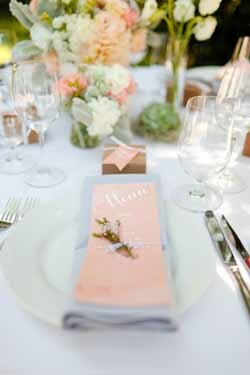 A white table cloth and chair covers will really bring out the two shades, making the colours pop. Adorn your wedding tables with lots of flowers – as this is colour scheme that suits Spring and Summer you want to make the most of blooms. 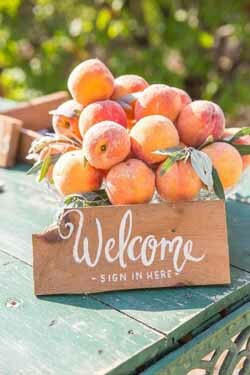 Peaches are obviously must-have wedding favours! 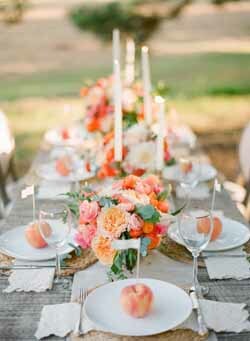 You could even use them as place settings, by putting a mini flag in each peach with your guests’ names on.